There are many, many people around the country currently dealing with one or more missing teeth. In fact, the latest research estimates that over 120 million Americans are walking around right now with incomplete smiles. If you count yourself among this group, then you can rest assured that a strong, durable, and natural-looking replacement is easily available. Dr. Stansbury is able to offer our patients dental implants, the most complete missing tooth solution available today. With them, he can completely renew your ability to eat, speak, and smile with confidence. To learn more or schedule a consultation, contact us today. 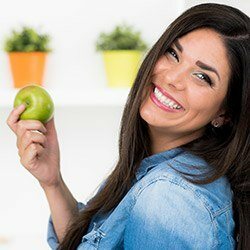 Why Choose Stansbury Dental for Dental Implants? Replace Lost Teeth For Life – No Slippage! 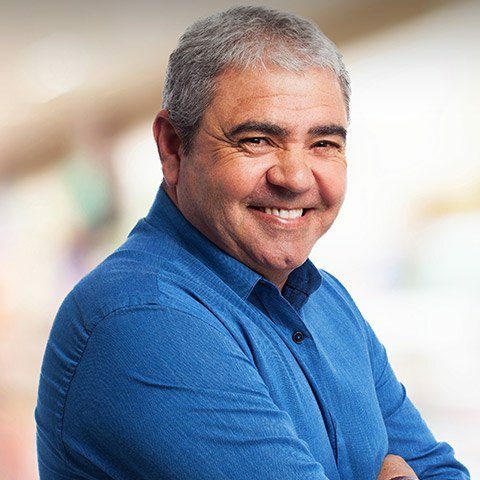 Unlike more traditional tooth replacement services, dental implants seamlessly replicate every original part of the dental structure, including the root that’s well-hidden underneath the gum tissue. This provides vital stimulation for the jawbone and a steady, healthy foundation for the eventual restoration. Dental implants are highly conservative and won’t require surrounding natural teeth to be significantly altered to accommodate their placement – we want to keep your original smile as intact and safe as possible! Dental implants are virtually seamless from natural teeth in terms of aesthetics, function, and overall feel. Dental implants are designed to go the distance in terms of longevity. Most patients are able to enjoy them for several decades or even the rest of their lives without issues. 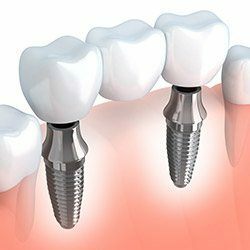 A dental implant is actually a small titanium post that is placed directly into the jawbone in order to recreate the root structure of a lost tooth. There, it can be used to support a number of restorations to bring back the teeth. This approach of replacing the entire tooth is what makes implants uniquely stable and lifelike. For patient’s missing a single tooth, we can attach a custom-made porcelain crown to an implant to seamlessly fill in the gap in the smile. 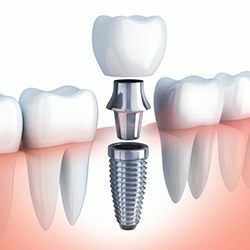 Dental implants can also be used to support a fixed bridge to replace multiple missing teeth in a row. Two implant crowns are placed on either side of the space, and these are used to support prosthetic teeth to fill it. Compared to a traditional bridge, implant bridges have a stronger fit, look more natural, and can be trusted to last longer as well. Plus, they can be placed without having to sacrifice any of your remaining teeth, unlike with a regular bridge. Do you have an unreliable denture that is constantly slipping out of place? If so, dental implants can help you enjoy a set of teeth you can finally trust. 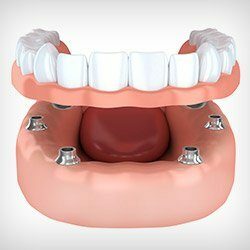 With an implant-retained denture, the teeth are actually secured directly to the jawbone using multiple implant posts, providing a secure hold a typical removable prosthetic simply can’t match. 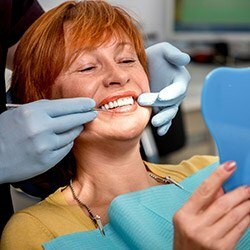 Implant dentures have also been shown to restore much more of a patient’s bite strength, giving them the ability to enjoy a more varied and healthy diet with ease. In order to make the dental implant process as smooth, comfortable, and successful as possible for patients, Dr. Stansbury regularly partners with implant specialists throughout the Tyler community. These trusted professionals will handle the surgical components of your care while our team takes the lead on the creation of a high-quality, painstakingly customized restoration. With each dentist working to their strengths, we strive to exceed your expectations at every turn. As with any dental procedure, cost is always a factor that is on people’s minds. 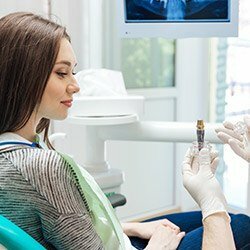 How much does it cost to get dental implants in Tyler? It really depends. 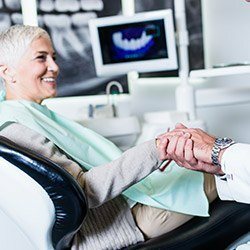 The final price of the procedure can vary from patient to patient depending on their particular needs and how many teeth they need to be replaced. However, in most cases, implants are actually the most cost-effective replacement overall thanks to their longevity. Traditional dentures and bridges usually need to be completely redone every 7-10 years, while dental implants can easily last for 30 or more.